Letting go of certainties – Where's my paintbrush? This keeps happening: I feel stuck at the keyboard, look up for a moment, and the “answer” appears. Or maybe I’m just becoming more open to and aware of the coincidences. Either way, I was once again shocked at how close the quote I had glanced at by chance matched the fragmented idea that had been percolating. Sheehy says a lot in that one sentence, and I’d like to share my take on it. Creativity requires action and a tolerance for failure. If you want to be creative, you have to let down your guard, forget the comfortable way, and open up and speak up. The uncertainties abound when you do this and can cause great personal discomfort. In my experience, that discomfort is fear, with some doubt mixed in for good measure. One way to avoid feeling these negative emotions is to refuse to let go – to seek certainty – believing that it will bring peace and ease and will keep the fear and doubt at bay. This doesn’t work. Making certainty the goal is actually quite draining and shuts down creativity. It is a paradox, because the certainty of a creative vision can point us forward, while the uncertainty of the outcome, others’ reactions, and the creative process itself can point in the opposite direction. I think Sheehy meant that being creative means embracing this contradiction, feeling the fear and doubt of uncertainty but moving forward anyway. Or, maybe even – as a friend suggested to me today when I shared this thought with him – tapping into those emotions to fuel the creative process is what enables forward movement. So, in the spirit of letting go of certainties and facing the fear and doubt head-on, I will share with you my most personal painting, a self-portrait I completed last year, and the story and creative process behind it. 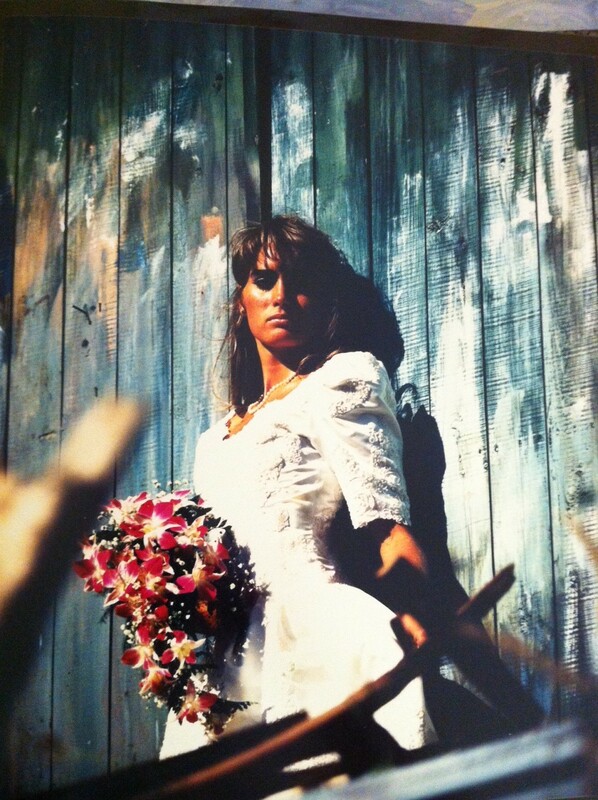 The painting is based on this photo from my wedding day, back in…let’s just say that digital didn’t exist when this photo was taken. The photographer manipulated the colors in the darkroom, not on a computer. As I was getting situated for the shot, he asked me to look serious, which is an odd request on your wedding day, but I obliged. Fast forward……the marriage ended fourteen years later. Fast-forward a few more years and I arrive at Michael‘s studio with this photograph in hand, and I inform him that it is just a guide, that I’m going to “modernize” it. I loved the blue fence in the background, so I told Michael, “We’ll keep the fence, I’ll paint my face and hair as they are today; we’ll make the dress a regular dress – oh, and we’ll make it orange (won’t that pop with the blue!) – and we’ll get rid of the bouquet.” He didn’t really respond, but I didn’t notice that at the time. 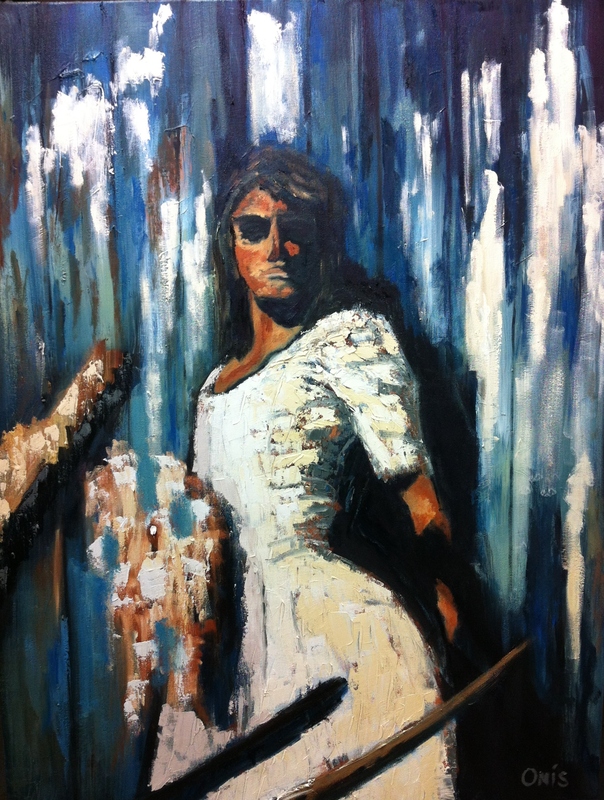 The painting took on a life of its own as Michael silently pushed me to tell the story of my marriage on the canvas. When he instructed me to mix whites for the dress, I was going to speak up and say, “Um, I need to mix orange.” But I didn’t. First, this says volumes about the type of instructor that Michael is. When the painting was finished and I stepped back from it, he said, “You did it.” While I learned a tremendous amount of technique with this painting, in particular gaining more experience using a palette knife and layering thick paint, the key lesson Michael taught me was to let go, face the fear and doubt, and paint what I really needed to paint. This painting provoked more emotional reactions than any other I had painted up to that point. My best friend was confused; another friend expressed compassion; a family member expressed hope; on and on. Isn’t that what art is supposed to do? Please reply and share your thoughts about letting go of certainty in your creative endeavors. I enjoyed this blog entry. There is a bittersweet element that the painting reflects. By the way, even serious you were a very beautiful bride. Great painting! Great story and thinking—not to mention a beautiful photo and arresting painting. I think that difference and contrast breed creativity. When that contrast is between what you thought the world was yesterday and what it seems to be today, then you get stressed and can block creativity by defensively denying the contrast. As you say, you have to open yourself up to the contrast and instead of short-circuiting your feelings, use them as a guide to find new ideas and expressions. Ha! Michael had you paint what was there instead of strain to make something up. I’d seen the painting but not heard this story. Great stuff. Thanks friends, for your replies. JD, yes! And, to Guy’s point, when I told Michael what I wanted to do, I was not embracing the contrast between me on my wedding day and me now. I wanted to paint me now, forget the past. So why would I bring Michael a picture of me from then? And the only picture from that day in which I’m serious? Pingback: The one certainty in making art | Where's my paintbrush?